Of course while there, he also checked out the local polar bears from a Tundra Buggy. He stayed in a former military rocket base turned research center and flew on a helicopter over the frozen wastes. But Northern Canada in late October is cold. So Speedy immediately left for warmer Tunisia next. He visited local ruins and the film sets of Star Wars movies. He ate dates, rode on a camel, and on a burro. He was also invited to dinner with a falcon. Speedy will be celebrating this occasion by relaxing on a beach in Florida. Little did anyone of us know at the time where this thing was was going to go, and I mean both the concept and the gerbil. He was only a few days old in those photos, having arrived just the day before I left for Bonneville. 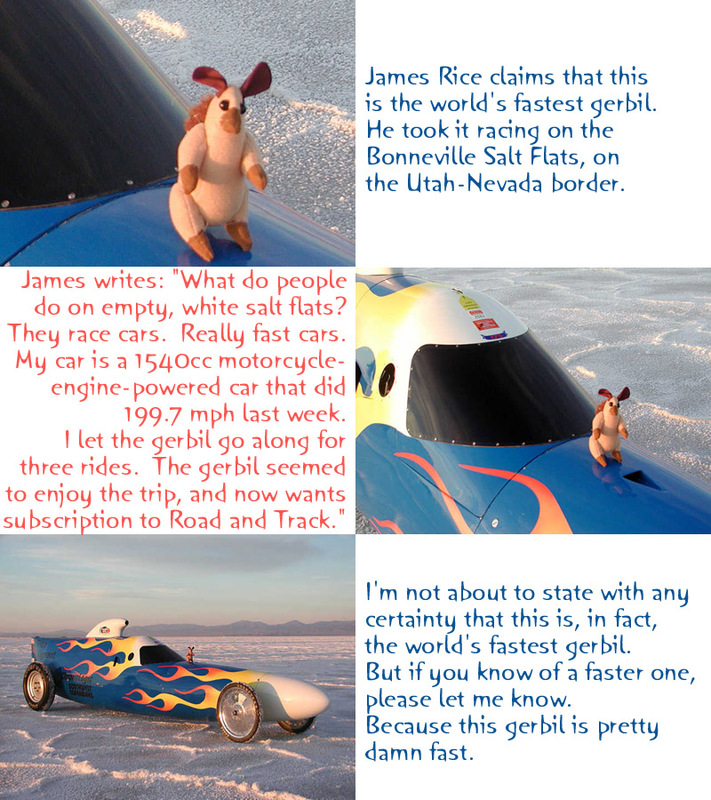 I had said that he was “the fastest gerbil on Earth,” which you translated into “the “world’s fastest gerbil.” That lead to some complaints that any gerbil that had been in an airliner had been faster. That of course lead to the rocket launch. But that’s a future story. In order for Speedy to claim the title “fastest gerbil on Earth”, he must defeat the impostor in head-to-head combat. We must arrange for this contest to take place with ex-Speedy and see! James Rice and Speedy certainly lead an interesting life. I hope to some day have a night I can say this about.